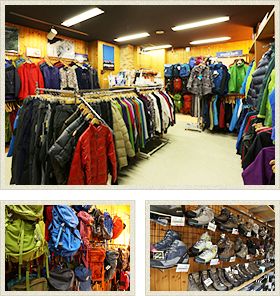 We offer various popular outdoor brands. Wide range of products are available, ranging from backpacks, climbing shoes, climbing gears such as hats, camping supplies, various supporters to skin care products such as UV protection. We test more than 90% of the new model ski every year, and we picked only our favorites to be in the store lineup. 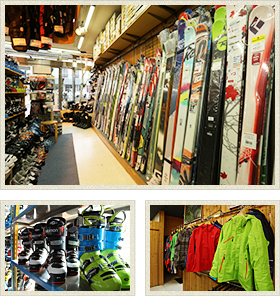 For skis and boots, we offer everything from the skis for groomed trail to backcountry, and cross-country, and we strive to offer various products to meet the needs of our customers. 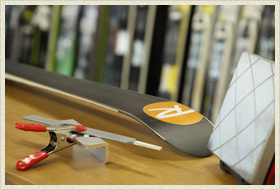 We also offer variety of ski waxes from major brands. We provide precise and detailed tune-ups. The service is catered to wide range of people, from recreational skiers to competitive athletes. ● The above prices include consumption tax. Please contact us for shipping to other areas. Body balance becomes unstable with the deformation of feet, especially in the area of forefoot and midfoot, when the heel is bent and tarsal joint loosens. As a result, the energy moving from the heel to forefoot are reduced, eliminating the dynamic driving force. In addition, this causes additional stress in ligaments and muscles, which results in distortion of pelvis, deterioration of blood circulation in internal organs, and stiff shoulders. 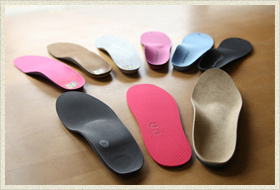 We mold custom insole that compensates the functions of the feet which in turn reduces muscle fatigues of the legsand also allow accurate transfer of the power. ▼ Legs easily gets tired. ▼ Pains in the soles. ▼ Shoulder line is tilted to either left or right. We make custom insoles for various types of sports shoes and ski boots based on the uses for those who are having problems mentioned above. Share your problems with us.